As the saying goes, man cannot live on cider donuts alone—so after our recent idyllic visit to Cider Hill Farm, we stopped at Hodgie’s for some ice cream. We’d heard quite a bit about this Amesbury stand from friends, and we were not disappointed. The ice cream, handmade on site, is extremely high quality, and there are a number of appealing flavors we don’t often see, including grasshopper, cherry chip, grapenut, and chocolate walnut. We tried the coffee fudge and the mint oreo cookie; both were excellent. We also sampled the cranberry-raspberry sorbet, which had tons of flavor and was extremely refreshing. Deciding which size to order can be confusing because the portions are truly enormous. One scoop is $2.95, and it’s plenty for one person. 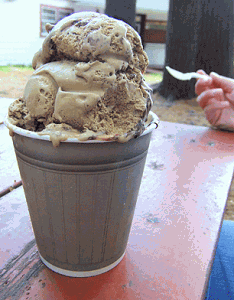 Two scoops are $3.80; it would be the equivalent of a large at most ice cream place and just right for sharing. Two of our group went outside the cone to try the peanut butter bomb and the crunch ball. Both were $3.25 and very large. 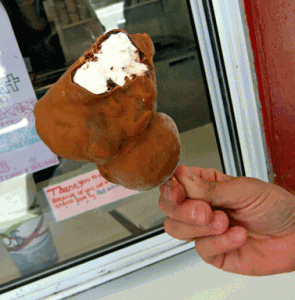 The peanut butter bomb is vanilla ice cream dipped in chocolate and then in peanut butter coating. It was delicious, as was the crunch ball, with vanilla ice cream dipped in chocolate and dipped in peanut crunchies. 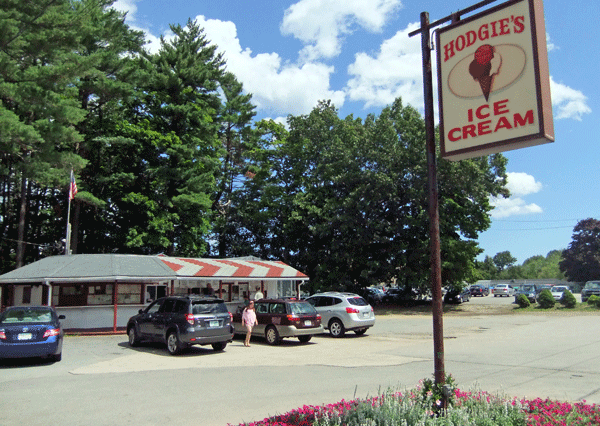 Hodgie’s also serves soft serve ice cream, soft serve frozen yogurt, as well as sandwiches, burgers, and fries. We didn’t get a chance to sample any of them, but we may on our next visit, which will coincide with their famous fall special: cider donut ice cream.